Marine biologists have been able to investigate and interact with fragile deep-sea organisms using 3D-printed soft robotic manipulators. 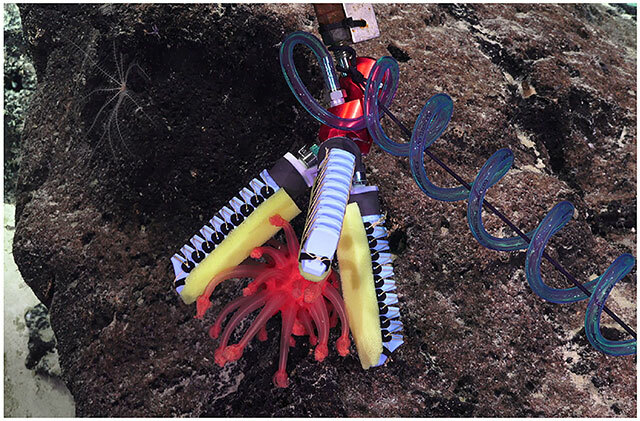 During a deep-sea expedition to the Phoenix Islands Protected Area, the scientists designed, 3D printed and used soft robotic manipulators for sampling species down to 2224 m via a remotely operated vehicle (ROV). The deep sea environment presents unique technical challenges for marine biologists attempting to interact with and collect marine life for research. Typically, researchers use devices made of inflexible metals but, because these tools were designed primarily for energy or military applications, they are often not suitable for touching soft-bodied and highly fragile organisms that may be found in the deep sea. By contrast, soft manipulators constructed out of compliant materials instead of rigid elements have shown considerable promise in deep-sea marine biological applications. Moreover, 3D printing of soft robotic manipulators enables real-time manufacturing and modification of tools in highly remote areas where engineering scenarios may be difficult to predict in advance. Based on instantaneous feedback from the ROV pilots and biologists, the team could rapidly redesign the soft manipulators by adding fingernails to the gripping fingertips. This modification enabled successful grasping of fragile animals such as sea cucumbers, which have historically been difficult to collect undamaged using rigid mechanical arms and suction samplers.